OPMs winger Jake Neville is the surprise inclusion in a strong Devon squad for tonight’s annual Tamar Cup clash with Cornwall at Plymouth Albion’s Brickfields ground (7.30pm). Neville is set to come on in the second half for the Green and Whites after impressing in open county training. He is the only level nine player included in both squads and could find himself up against Plymouth Albion players Matt Shepherd, Jon Dawe and Fraser Honey, who are named in the Cornwall side. 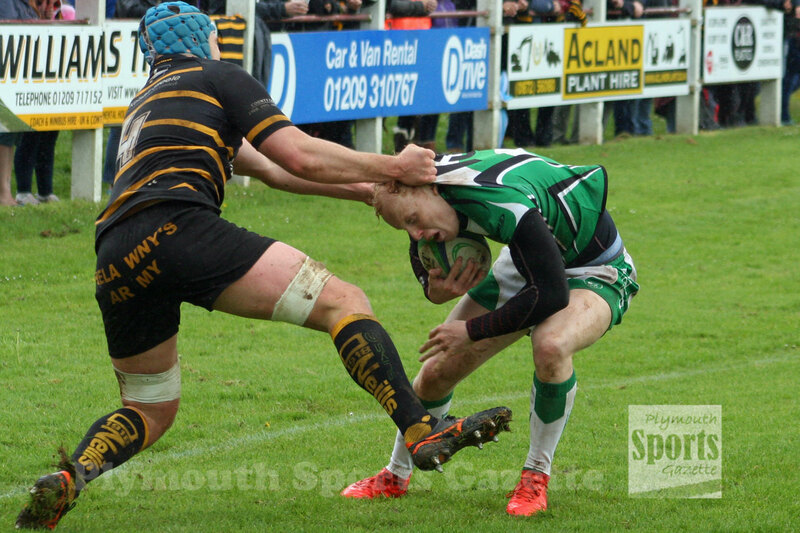 Saltash’s Lewis Wells is also included in the Cornwall squad, while Ivybridge’s Charlie Briant (pictured), Billy Pinkus, Ben Watts, Ben King and Lewis Paterson are named in Devon’s party, along with Plymstock Albion Oaks players Tim Coats and Aiden Taylor. The Devon squad also includes former Albion player Tom Putt, ex-Ivybridge back Mitch Pinkus and Plymouth-based Dean Avery. Devon’s County Championship head coach Dan Parkes has handed over responsibility for tonight’s match to fellow former Albion player Wayne Sprangle, who will find himself going head-to-head with his ex-Plymouth boss Graham Dawe, who coaches Cornwall. Cornwall have won the Tamar Cup for the last eight seasons but Devon did beat them at Camborne in last year’s County Championship. Devon: 15 Charlie Briant (Ivybridge), 14 Billy Pinkus (Ivybridge), 13 Rhys Palmer (Okehampton), 12 Mitch Pinkus (Brixham), 11 Kieran Lee (Okehampton), 10 Tom Putt (Newton Abbot), 9 Ben Watts (Ivybridge), 1 Matt Dorwick (Newton Abbot), 2 Dean Avery (Newton Abbot), 3 Charlie Tribble (Exmouth), 4 Tim Coats (Plymstock Albion Oaks), 5 Karl Pearce (Okehampton), 6 Tom McGratton (Okehampton), 7 Ben King (Ivybridge), 8 Caleb Sampson (Barnstaple). Replacements: Gaz Walker (Cullompton), Aiden Taylor (Plymstock Albion Oaks), Olly Schuster-Wood (Cullompton), Tom Bottoms (Newton Abbot), Dean Abrams (Okehampton), Peli Vea (Sidmouth), Jacob Nash (Taunton), Lewis Paterson (Ivybridge), Connor Bedwell (Brixham), Jake Neville (OPM), Josh Luxon (Cullompton), Jordan Watson (Brixham), Jake Prophett-O’Neill (Withycombe), Ryan Lee (Okehampton). Cornwall: 15 Matt Shepherd (Albion), 14 Kyle Spear (Bude), 13 Declan Matthews (Camborne), 12 Jon Dawe (Albion), 11 Harvey Bell (Camborne), 10 Fraser Honey (Albion), 9 Noah Nash (Barnstaple), 1 Dan Job (Lanner), 2 Tommy Lee-Southworth (Camborne), 3 Andrius Zacharovas (Camborne), 4 Ben Hilton (Barnstaple), 5 Rupert Charles Edwards (Wadebridge), 6 Adam Hughes (Penryn), 7 Tony Whittle (Camborne), 8 Grant Randlesome (Penryn). Replacements: Hugh Noot (St Austell), Miles Davey (St Austell), Ben Nicholson (St Austell), Dan Sanderson (Falmouth), Lewis Wells (Saltash), George Jones (Penryn), Darren Livett (Wadebridge), Tarron Peacock (Camborne), Frazier Nottle (St Austell), Rhys Brownfield (Camborne).